This is my favorite coloring contest. 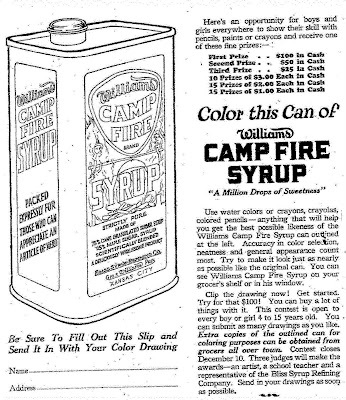 This ad for Williams CAMP FIRE SYRUP appeared in newspapers on October 23, 1925. "Strictly Pure made of 75% Cane Granulated Sugar Syrup, 25% Maple Sugar Syrup, Scientifically Blended, A Deliciously Wholesome Product" by the Bliss Syrup Refining Co., Geo. R. Williams, Pres., Kansas City. The coloring contest was open to all boys and girls 4 to 15 years old.